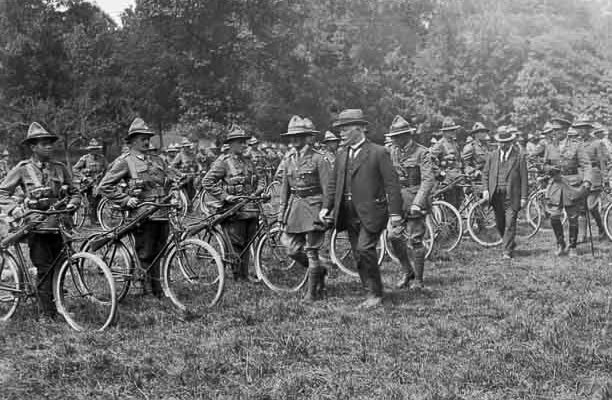 PM William Massey inspects the New Zealand Cyclist Corps at Oissy, 3 July 1918. The New Zealand Cyclist Corps, which served at various times as the II Anzac Corps Cyclist Battalion, XXII Corps Cyclist Battalion and New Zealand Cyclist Battalion, was added to the New Zealand Division in April 1916. Starting as a single company, it was formed in New Zealand from men training to be mounted riflemen. The unit arrived on the Western Front in July 1916, when it was split into two companies and was attached to II Anzac Corps. For most of the war it did not fight with the rest of the New Zealand Division but as a separate unit attached to other corps within the British Army. Cyclist battalions performed a similar function to mounted riflemen, conducting scouting and reconnaissance work. Like mounted riflemen they were of little value in trench warfare conditions, so spent much of the war on navvying work. They were particularly involved with burying telegraph cables, and at times served in the trenches as infantrymen. The New Zealand cyclist companies served exclusively on the Western Front, participating in the Messines and Passchendaele offensives in 1917 and the Spring Offensive and Advance to Victory in 1918. In January 1918 a third New Zealand company was created to replace an Australian one that had been transferred. The three New Zealand companies were then designated XXII Corps Cyclist Battalion. In September 1918 the unit was renamed the New Zealand Cyclist Battalion. Cloth patch worn by the New Zealand Cyclist Corps. Cloth patches sewn on the backs of uniform jackets from October 1916 identified which unit – or part of a unit – an individual belonged to. Cap and collar badges: Wheel with crossed rifles surmounted by a crown and a scroll underneath with the words ‘NZ Cyclist Corps’. An earlier badge featured a winged cycle front wheel and handlebars, with a scroll beneath reading ‘NZ Cyclist Corps’. Shoulder title worn by the New Zealand Cyclist Corps. The New Zealand Cyclist Corps wore the same puggaree (hatband) as the mounted rifles. The New Zealand cyclists at Messines (WW100, June 2017). NZCC-inspired Under 23 National NZ Champs trophy - see related blog posts here and here and video. * On NZCC official history Roll of Honour but listed under different unit by Commonwealth War Graves Commission (CWGC). ** Listed by CWGC but not on official history Roll of Honour. Aparently because they either died of disease or died after the Armistice.